A story about computer science and other improbable things. Laurie is lost in Userland. She knows where she is, or where she's going, but maybe not at the same time. The only way out is through Jargon-infested swamps, gates guarded by perfect logic, and the perils of breakfast time at the Philosopher's Diner. With just her wits and the help of a lizard who thinks he's a dinosaur, Laurie has to find her own way home. 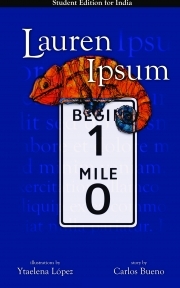 Lauren Ipsum is a children's story about computer science. In 20 chapters she encounters dozens of ideas from timing attacks to algorithm design, the subtle power of names, and how to get a fair flip out of even the most unfair coin. Carlos Bueno is an engineer at Facebook, where he makes things go faster. He is the author of many articles about computer science and the structure of the internet.